Villagers immune to rabies found in the Peruvian Amazon, Chile’s Very Large Telescope spots a spiral galaxy, and scientists strap a camera to a diving cormorant in Argentina. Argentine scientists with the Wildlife Conservation Society have captured video of never-before-seen behavior from a cormorant diving 150 feet to the sea floor in search of food. The bird made the trip in 40 seconds and returned to the surface with a small fish. A team of scientists has been studying 3,500 pairs of cormorants at Punta Leon in Patagonia for seven years. Scientists in Argentina have discovered a protein that is integral to tumor development in mice and published their results in the journal PLoS ONE. When researchers at the Institute of Biomedical Investigations in Buenos Aires found that overexpression of the protein ACSL4 (acyl-CoA synthetase 4) resulted in breast cancer tumor development in mice, they designed a treatment with a cocktail of protein inhibitors (which included an inhibitor to ACSL4) that reduced tumor growth in certain cancers. UPDATE: The BBC has highlighted the ongoing trial against two soybean farmers and a pilot for cropdusting too close to urban areas in Córdoba, Argentina. “This is the first trial in Latin America that has reviewed the use of farm chemicals. We’re trying to prove that there has been illegal pollution in this community,” the BBC quoted public prosecutor Carlos Matheu as saying. Chile’s Very Large Telescope captured the most detailed photo yet of the spiral galaxy NGC 1187. Credit: ESO. 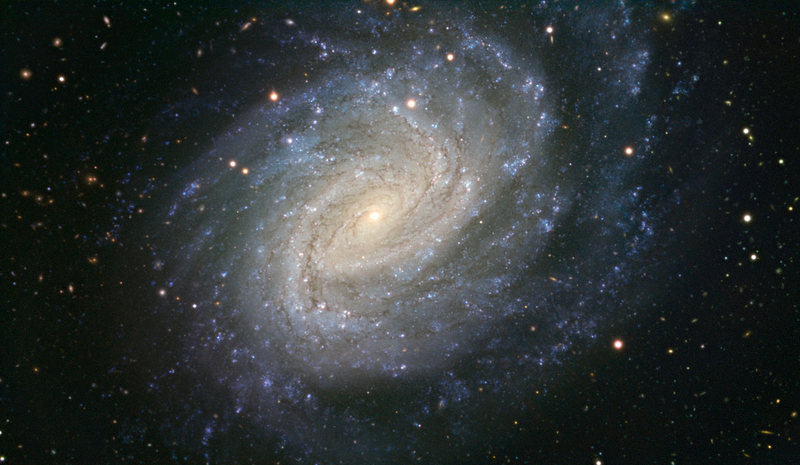 The Very Large Telescope (VLT) at the Paranal Observatory in northern Chile has taken the most detailed photo yet of a spiral galaxy 60 million light-years away. The galaxy, named NGC 1187, has hosted two supernova explosions in the last thirty years and has half a dozen spiral arms tinted blue. Two Colombian chemical engineering students are using coffee grounds to extract the heavy metal cadmium from water. The Universidad Nacional researchers showed they could remove 7.91 mg of metal per gram of coffee. Cadmium is a byproduct created when smelting zinc, lead or copper ores, and is listed as a probable carcinogen by the EPA. The AP reports that Panama is trying to become the first Central American country to employ transgenic mosquitoes to combat dengue fever. Panama’s ICG tropical disease research institute says it will use technology developed by British company Oxitec to genetically modify Aedes aegypti mosquitoes. The company injects a gene into the insect eggs that causes the overproduction of a protein which eventually kills the mosquito. A group of people in Peru’s Amazon seem to be immune to rabies, a viral infection that can be fatal if left untreated. A Centers for Disease Control study published this week in the American Journal of Tropical Medicine and Hygiene reports that villagers in two areas of the remote Peruvian Amazon had been exposed to rabies—most likely from vampire bat bites—but were able to clear the virus before infection. Eleven percent of the 63 villagers they surveyed had rabies antibodies. Uruguay’s Ministry of Agriculture is reporting that citrus farmers have lost 115,000 tons of crop to frost and “adverse climate conditions.” This adds up to $35 million in losses as half of the volume of Uruguay’s citrus exports is affected. In Argentina, similar frosts and periods of intense heat have forced a state of national emergency.